Today, I’m skipping my duties as a blogger: no “Canadian List of Ten“. I have a killer excuse: this Saturday, I’m taking a 5 hours long French as a second language exam at the university to prove that I can actually speak French. No kidding. This is not exactly how I like to spend my Saturdays after a long week at work. Merde. For those in Paris or around: my dad is having an exhibition of his paintings in the suburb of Paris. From November 12th to December 6th, he is actually painting in the art gallery in front of the visitors. 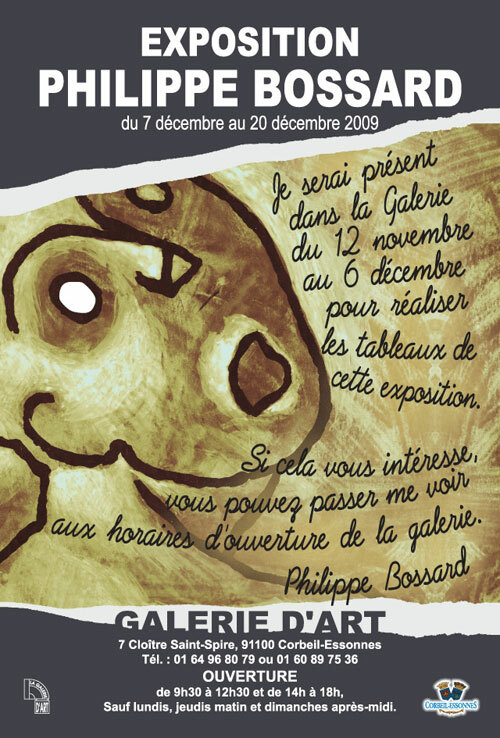 The exhibition will then last till December 20th, 2009. Go check it out and say hi from me, the ungrateful daughter who can’t fly home to admire his art! Go kick their freaking asses Zhu! .-= Guillermo´s last blog ..Fin de semana… Tema Libre! =-. Oh…I will be in Paris around December 18… if I have time and if the gallery is not to far out of my way I will try to have a look and say hi if I see your father. so *that* is where you get your artistic ability! i wish i could be in paris to see that. i like the exhibit poster. best wishes on your french test. you should be able to finish it in half the time. je pense en francais; donce je suis. .-= Seraphine´s last blog ..This girl is not a safe alternative to cigarettes =-. Cool, I hope your dad’s exhibition goes well. I hope we can get some pictures from the exhibit. As for your speaking French, I agree with the authorities. Prove it to me. Prove it. I don’t believe you can 😉 Let’s make things as complicated as possible, right? .-= Seb´s last blog ..Big Bear Is Watching You. Again. =-. .-= Shantanu´s last blog ..Southern Spice =-. @Guillermo – I hope I did! @Seb – 😆 It’s exactly that, how to make things Kafkaesque! I wish I’d get some pictures of the exhibition but I’m not counting on it, since I am the official photographer of the family. @shionge – I wish I could have gone too! Wow. I never knew that artistic talent runs in your family! No wonder you draw those pictures well that decorates your blog! And how did you French exam go? .-= Linguist-in-Waiting´s last blog ..The Axe Murderer and the Ice Princess Cometh =-. .-= Priyank´s last blog ..Three years in Toronto =-. Je suis très honoré de figurer dans ton site Zhu. De même j’ai été sensible aux réflexions de tes visiteurs pour ce que j’ai pu traduire.